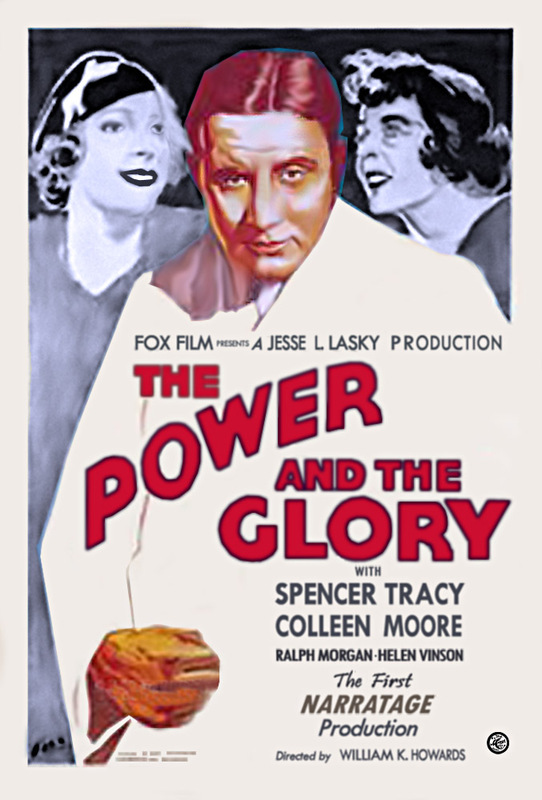 The loyal friend (Ralph Morgan) of a dead railroad magnate (Spencer Tracy) relates stories about the magnate’s rise to power and romantic losses. Years before he became a renowned director of screwball comedies such as Sullivan’s Travels (1941) and The Palm Beach Story (1942), Preston Sturges wrote the screenplay for this unique flashback tale, directed by William K. Howard. The story itself is fairly straightforward — a poor man rises to power, only to find that his marriage has suffered in the meantime — and Tracy’s character is never fully developed (he goes from contented trackwalker to ruthless tycoon without much of a legitimate trajectory in between). But it is Sturges’ decision to tell this story in asynchronous vignettes — switching back and forth in time, as the actors wear wigs and make-up to show their advanced age — which makes the film so special; we’re used to this kind of structural device these days, but in 1933 it was (as far as I know) unheard of. Orson Welles purportedly watched this film again and again as he explored ideas for what was to become his masterpiece, Citizen Kane, and the influence is clear — in subject matter (both are posthumous stories about the rise-and-fall of a business tycoon), and in narrative exposition. While it doesn’t come close to the overall greatness of Kane, The Power and the Glory nonetheless deserves special recognition in cinematic history. P.S. In one particularly creative sequence, as Morgan is relating the tale of how Tracy proposed to Moore, we see an effective technique (coined by the film’s producer as “narratage”) in which Morgan dictates while the characters’ mouths are silently moving. Yes. While not entirely successful, this movie holds a special place in film history, and should be seen by all film fanatics if possible. Yes, a must – reasons well stated. Re: Tracy, though…I find his character developed rather well, particularly for such a short film. Tracy was a solid, dependable actor – offhand, I can’t recall him ever giving a bad performance. Even in this early film, he has authoritative presence – it makes one curious about the 17 films he made prior, though it appears most of them are lost.